Hobart has been voted as having the best lifestyle of any state capital in Australia. Here is one reason why. Almost nowhere else is it possible to drive less than 15 minutes from the business centre of the city and enjoy coffee or lunch in a restaurant set in a secluded five-hectare vineyard that could be right out of Tuscany. The Coal Valley Vineyard and restaurant, lovingly tended by Todd Goebel and Gillian Christian, is the first cellar door en route to the historic village of Richmond. Coal Valley Vineyard is the gateway to the world-renowned cool-climate wine district of the coal river valley. 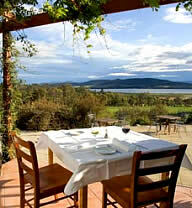 The dining room and terrace have panoramic views across the vines to Barilla Bay and the Broadwater. The food is rustic Italian in style. Herbs, vegetables and fruit come from their own garden. Wines of note include their award-winning 2005 Pinot Noir and Tasmania’s first tempranillo wine – in the style of Spain’s top red variety. Great wine, great food, in a great setting, and all on your doorstep. Does life get any better? Graeme Phillips is the doyen of Tasmanian food and wine writers. For contact and location details, visit the coal valley vineyard website. A blaze of autumn colour at Coal Valley Vineyard in southern Tasmania.